From Australia comes Acron, the World’s sensational strong-man. 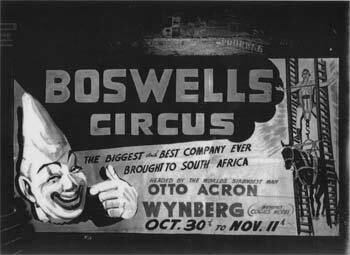 Boswell’s are indeed fortunate to feature him in their 1961 National Circus. His appearances in Australia have been nothing short of stupendous – running over a greatly extended tour for many months. Here is a man who proves his strength. Feats such as that performed by Acron have not been seen or equalled over the past 60 years… not since the days of the late William Pagel. His amazing act include lifting a horse off the ground, several feet in the air; holding at bay two lorries, one with each of his fantastically strong arms and he has used Elephants too, as tests of his remarkable strength, for another of his feats is to have two elephants attempting to move him from the centre of the ring. Such feats has taken Acron all over the civilised world and gained him the plaudits and admiration of many, many thousands. 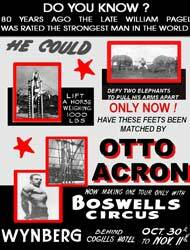 Acron takes it place amongst “The Greats” of the World of Strength, such as Charles Atlas, Eugene Sandow, Steves Reeves and others equally as famous. He has several offers to appear in both British and American film productions, but in visiting South Africa he is fulfilling his lifelong ambition – to see our beautiful country and, as Acron laughingly says” South Africa first, film making will have to wait. They breed ‘em strong down under. 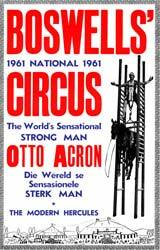 Otto Acron, The modern Hercules from Australia, Proved this when he climbed a double ladder with an Elephant suspended in harness attached to his shoulders. Former Amateur Wrestler Acron is merely flexing his muscles here. When he gets warmed up, two Elephants can’t move him from the Boswell Circus ring and he can hold off two Lorries. Otto is said to keep in trim by “Daily bouts with weights” – Presumably a couple of steam rollers on a bar. In the history of strongmen, there are three names which can be called immortal: Eugene Sandow, George Hackenschmidt and Max Sick. They were all good friends of mine in the first decade of this century. Lately, I have met a strongman who, according to my opinion, has the same ‘something’ possessed by Sandow, Hackenschmidt and Max Sick. I speak of Otto Acron, whom many readers of this paper have certainly seen. He carries a 1,000lb. horse up and down a ladder. It is really a pity that this strongman does this difficult task in such an easy manner. To tell you the truth, this task has only been performed by one other South African strongman. He was the Iron Man Pagel, whom most of us have seen in action. My old friend Pagel weighed about twice as much as young Acron, and I can assure you that he did not perform this feat of strength with the same confidence and smoothness. I introduce Otto Acron to you – not because he is a strongman, but I feel that he has the ability to some day become one of the ‘immortals’. Eugen Sandow was the world’s greatest stage strongman of the past. He was really not as strong as Otto, but still remains one of the three immortal strongmen. Acron states that he can lift much more than he does in his performance, and I am convinced that he will astonish circus audiences with even greater exhibitions of strength. While he was in Cape Town, Otto visited me every day, so that I might teach him the things that I have learned during my long life as a strongman.